Christ is Risen, He is risen indeed! Amen! We’ve all heard or seen things that we didn’t quite believe. The call of a loved one’s unexpected death, hearing that your mother has breast cancer, seeing the aftermath of the plane hitting a building where people you know work. The day I heard my grandfather died, the day my mother told me she had cancer and the day in 2011 seeing the aftermath of the plane hitting the Pentagon, the events were very vivid for me. My initial response to all these events was shock and disbelief. I wanted to hide and escape from their reality. There were moments when nothing could break through the fear and doubt. The disciples in the upper room where no different. They had witnessed Jesus die. The had seen Christ crucified and buried. And now they were overcome with grief. They had heard the story of the empty tomb, of Mary Magdalene, Peter and the other disciple seeing the risen Christ. But for the disciples in that room fear and grief prevented them from believing. Which is understandable, when you see somebody die you don’t expect them to just be resurrected as if nothing happened, Do you? They had locked themselves in that upper room not just physically but also emotionally and spiritually. At that point, the disciples were more concerned about themselves than whatever else might be happening. They were grieving for their beloved teacher. They were fearful of what others might think, what might happen to them. They could be mocked, beaten or killed. Peace in Hebrew is Shalom. However, it means more than the stereotypical end of violence, hippy peace. The kind we often casually say I hope for Peace on Earth. It means more, It means reconciliation, restoration, and completeness. Christ’s peace for me came in the witness of my mother. The shock of hearing the word Cancer from my mother was frightening. You expect the worst when you hear that word, Cancer. Despite my shock, my mother was calm. How could she be so calm? It was Cancer, that thing other people got not my own mother. It was puzzling to me. I asked if she was afraid and she responded, “Of course I’m afraid, but Christ is with me.” There in the midst of her pain and fear she was able to see Christ’s presence. To experience Shalom. Hearing her witness I began to see Christ’s presence as well. I began to believe. Fear and Doubt are real. You may feel like you can’t have faith if they are present but Jesus enters despite our fears and doubts. Jesus comes past the barriers, the locked doors, and the tough questions. Out of fear and doubt, Jesus gives us a faith that becomes even more real. Jesus offers his peace and he also gives us a task to share that peace with others. Breathing on the disciples, Jesus offers his presence through the Holy Spirit. 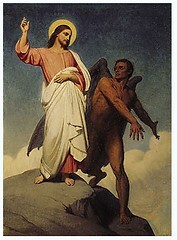 Jesus then gives his disciples a command. “As the father sent me, I send you” He sends the disciples and us with his peace and his presence to others, for the forgiveness of sins. He says, “If you forgive anyone’s sins, their sins are forgiven; if you do not forgive them, they are not forgiven.” Jesus desires that his peace be made complete. He offers forgiveness that makes us complete with God but also with others. He offers himself. The disciples were so excited. Jesus was alive after all, The one who was crucified and buried had conquered death and was with them. The first person they tell is Thomas. Thomas, the disciple who was missing. The friend that was missing. In this excitement Thomas responds to the news that Jesus is alive with “unless I touch and see the holes in his hand and his side I will not believe.” Why couldn’t he just believe? We all know someone like Thomas. The person who questions what people say and is a skeptic. The person who doesn’t quite know what to do with all this religious stuff. They are all around us. It is the homeless person who walks by the church but doesn’t enter, It is the friend that doesn’t understand the whole church thing, it maybe, even yourself. Despite Thomas’ doubts, his unbelief and his conditions for belief, the disciples welcome him among them. That next week, they are in the upper room and Jesus enters again. Jesus again says “Peace be with you” Before Thomas can ask anything. 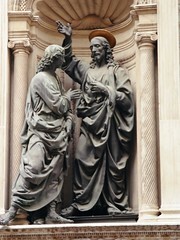 Jesus offers for Thomas to touch and see. Jesus is the only one who can offer Thomas what he needs. The other disciples can’t. Thomas sees Jesus and believes saying “My Lord, My God.” The one who doubted believes when he encounters the risen Christ. In the midst of doubt and unbelief, Jesus comes and offers Thomas the Gift of Faith. In midst of questions, Jesus offers answers. In Thomas’ unbelief, Jesus offers him what he needs so that he can be a witness with those other disciples. When I first talked to my mother about her cancer, I couldn’t help but have some doubts. I couldn’t help but wonder what might happen. Faith could only get you so far I thought. But her perseverance proved otherwise. My mother’s faith was a gift in the midst of my own doubts and fears. It got me through doubt as my mother went through treatment. It drew me closer to God and to my mother. Through her witness, I became a witness to the risen Christ. The gift of faith Jesus offers is meant to be shared. It was through my Mother’s witness I saw Christ. Christ sends us to welcome the Thomases in our lives, to the bring them to witness the risen Jesus. Christ asks us to include those around us. Those Thomases in our lives. Christ encourages us to live beyond our fears and doubts to include others, those right outside our comfort zones, so they might witness and believe in Christ. We can include them in a hope that Jesus will show up. We can give them a place to ask questions and to share our experience of Christ with one another so that all may believe and have new Life in Christ. We can’t make Christ appear like a magic trick, but we can believe Christ will show up. We can come to together in this place to share Christ’s promises, to remember his Life, Death and Resurrection in our own lives through Baptism, to share his presence at the table in bread and wine and through worship. Christ is here among us. Let us open our doors and our hearts like the stone is rolled away from the tomb so that those who want to see the risen lord may see him.